Portraits continue to be fascinating genre of photography, whether it is a single photograph of an individual, an entire book devoted to one person (Anne Deniau’s Nicolas Le Riche comes immediately to mind) or about a group of people with a shared commonality (Martin Schoeller’s Female Bodybuilders). We visual explore their topological lines, mass and shape seeking clues to their identity or perhaps in an attempt to find our own identity. 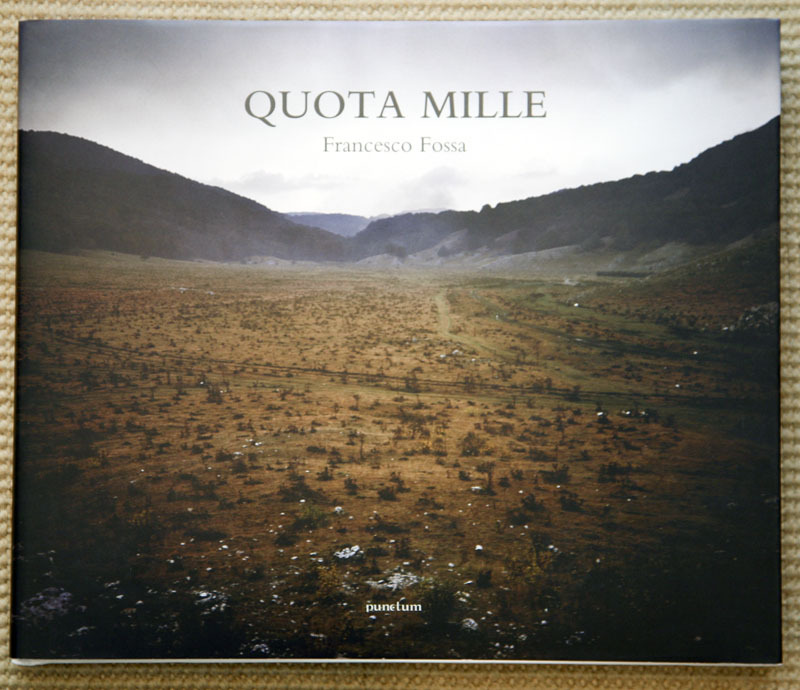 In a similar project, Francesco Fossa investigates a region of Italy know as the Matese, delving into the collective identity of this community in his photobook Quota Mille. Ironically, what results is perhaps as much autobiographical as it is a personal documentary project. In the accompanying essay we learn that Fossa was born and raised in Piedmont Matese at the base of this mountainous and rural countryside, passing through the area only fleetingly. Subsequently Fossa left the region to live and work in Rome. This book resonates in a similar nature as Rania Matar’s photobook Ordinary Lives; Fossa has returned with dual sensibilities, one who can speak the local dialect and understand many of the underlying social rules, but also with the eyes and experiences of a sophisticated outsider. Using a documentary style, Fossa mashes together a wide variety of portraits to assimilate a collective portrait of this regional community; formal and informal environmental portraits of his subjects that are in and around their homes, as well as working in their gardens or tending their flocks. Likewise there are formal environmental portraits of the structures and objects that are an integral to the lives of those who choose to live in this region. Together these photographs weave a story about a rural agricultural region of Italy. Fossa’s subjects acknowledge his presence, whether in a tight formal setting in which the sitter is wearing their best or in an informal environmental situation at work. All but a few of his subjects maintain direct eye contact with him and his lens, which also establishes a direct link between his subject and us, the viewer. His subjects, by acknowledging Fossa’s presence, strike posses that are autobiographical, in that his subjects choose how they should be viewed in the circumstances selected by Fossa. As an example, in a garden or field, surrounded by their handiwork and results of their toil, the women stand upright and erect, unsmiling, stoic with almost quizzical expressions, perhaps in wonder as to why Fossa was choosing this place and time to photograph them. With the unique access of an insider, Fossa appears to move about his subjects freely, with access to the inside of their homes and amongst their work areas. We obtain momentary glimpses into the surrounding environment conditions, perhaps enough to establish a sense of their simple and straight forward existence. Objects and clothes appear functional with indications of heavy wear in this rural community. Likewise, what draws Fossa into this community and captures his interest enough to release the shutter is somewhat telling about the photographer. He appears to fully engage his subjects, coming in close enough to frame them tightly within the photograph. He expresses his curiosity about their handiwork as well as venturing out to accompany them to their fields. Fossa also has a formal and static style, centering his subject or object in the middle of the pictorial frame, as though to ensure we know what it is he is photographing. He also creates engaging photographs, providing details that seem to pull me comfortably into the photograph, but correspondingly, there is only the slightest tension created by his photographs. The essays, with the text in both English and Italian, are provided by Paolo Rumiz and Francesco Fossa.